Well, hello you! Great interview. I only wish you’d dug into this. But then, I’m a rotten old crank. I’m surprised by that. I would have thought Spielberg would be more down to earth. What did the animals think of the house? They thought it was nice. The priest looks like the singer Jonathan Richman. I spend a lot of time online because I get tired reading and there is an almost constant sound of the denouement outside, the cars and the roar of the planes – I’m sure they’re not – or sound effects, I haven’t worked out which in five and a half years, although I do see the cars. I was just thinking of what Dostoyevsky might be an acronym for and so as well as to aggravate me, and I hadn’t thought of it, it might be to entertain the killer(s). I am gassed – I don’t know if the clicks increase the emissions or are to eventually deafen me – and the food I buy is mainly terrible. They must be retarded the people the get to do it. It got worse after one neighbour moved out and another moved in. I currently have three slugs on the bathr -radiator click, whichs ometimes happens if they think I’ve plugged it in and turned it on when I haven’t (hesitation, deviation or whatever the other thing in the radio programme -car goes by on lane at 12.20 – another radiator clicks) – bathroom walls. So they might think I need exorcising. However, I think they’re intelligent and, with respect, greater poets than yourself if that’s their thing. I thought they might be saying something about homeless people hanging around. When I returned from the United States in 2014, I think it was, I had visited Forest Hills and imagined earlier internments in the buildings there (unfortunately I didn’t get around to returning on subsequent visits) and when I came back the wasps who had been in the flat for a year almost were re-enacting it for me on the extractor above the stove, which looks like a building, but unfortunately quite soon after they disappeared without my really noticing exactly when they did. inevitably with these views I see myself as something of a person apart. I realise this is unpleasant as well as unjustified but it does help when I am isolated and have had my remaining future rather taken me from the dentists, one of whom looks like one of the people in your pictures. I hope I wasn’t sort of invited onto this site – I was sent links to my work email – to antagonise any of them, including John. Although it might be a different John. Very loud clicks of the radiator at 12.35. Do they think they’re onto a winner, literally, with these last posts? It’s so vile. Well done, JOB. I’ll be coming back to this whenever the subject comes up, which, thankfully, isn’t very often. I’ve always avoided films like “The Exorcist” and “The Conjuring”, probably just because they just don’t appeal to me, but the reason they don’t appeal to me might be because my sense is that the movies themselves are evidence of a fascination with evil that predictably leads to still more fascination and then more evil. Don’t get me wrong, there has been loads of temptation and sin in my life, as with most any life, but even amidst all that I’ve been blessed with a spirit of preservation and protection, for which I’m grateful. The passage from this interview that really struck me was this: “The most difficult cases are a both/and—both mental health issues and demonic affliction. It’s easier for the exorcist if it’s one or the other.” I’m struck by this because—without any experience of exorcism—this seems to crystallize the problematic nature of possession in our age. I think mental health problems, broadly understood, should be seen like any other privation of good: an evil, yes, as well as an opportunity for grace. Great or small, too. But are we to understand it as a matter of degrees? Are we to draw a boundary line for every disorder so that, for example, Deprssion is a mental health problem, but when someone diagnosed with Depression for years begins levitating, then it’s time to call in the priest? This can’t be right, I don’t think, since even your ordinary, run of the mill mental issue is a privation of sorts (as well as an opportunity for grace). In brief, it seems never to early to call for a priest (by, say, going to confession), and never to late to call for a doctor (maybe to put some Neosporin on those mysterious scratches that appear d out of nowhere). 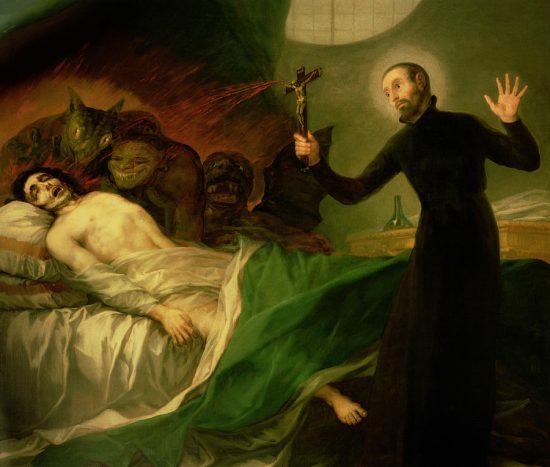 What this means, it seems to me, is that most exorcisms and the problems they treat will always remain problematic from the point of view of our contemporary culture: to some extent mental, to some extent spiritual. And for many people, mostly mental, but when the problem becomes inexplicable, well, then, it can’t really hurt to entertain a supernatural explanation. Somehow this doesn’t seem satisfactory. We ought to be able to make these distinctions more clearly. In the meantime, we muddle through as well as we can.